This is the 5.65 x 5.65" Low Light Ultra Contrast 4 Filter from Tiffen. Bright lights or sunlight create problems when the ratio between the highlight and shadow areas is beyond the latitude of the film. If you expose for the highlights, the shadows appear without detail. If you expose for the shadows, the result is washed-out, overly bright highlights. Contrast reduction is achieved by lightening shadows without overexposing highlights or by darkening highlights without darkening shadows further. 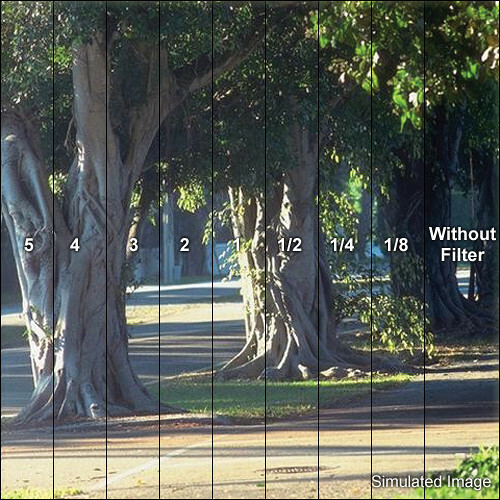 This filter uses the surrounding ambient light to achieve an even balance between highlight and shadow.